When choosing a hairstyle for your wedding day, there are many things to consider. This is one of the most important days of your life, and your desire is perfection. View it as a fun challenge, and try not to get stressed. Make it easier by looking at magazines, searching the web and booking a trial run with your stylist. Keep a photo diary, be open to ideas and be realistic about your hair length, and texture. Book a trial run with a stylist who is prepared to create 2 or 3 styles, is comfortable creating up-dos and can offer advice and suggestions. Be absolutely happy with the styles created if not, consider booking a different stylist. Look through magazines and websites to narrow down your choice and bring the images to the stylist. Be realistic with your style choices. Your long straight hair may not hold spiral curls for 10 hours, so would be better suited in an up-do. Your naturally curly hair may not straighten so choose styles that incorporate your natural curl. Consider your venue, ceremony time and gown. If you are planning a garden wedding, or an informal afternoon event, long flowing hair with a fresh flower tucked behind one ear would be fabulous. If you are planning a formal event in a ballroom, wearing an elegant beaded gown, consider a red carpet up-do, such as a French twist. Are you wearing a veil, tiara, or decorative hair pins? Bring these items to your hairstylist, and determine a style that works well. If you are planning to remove your veil, ensure your hair style allows you to do this easily. When looking at veils, ensure a small comb is attached to slide into your hairstyle easily. Will you be pulling the blusher over your face? If so, where will the veil be placed in your style to allow you to do this? Do you want the veil to be worn as an accessory at the back of your head, or to fully frame your face? Decide this before you finalize a hairstyle. If you prefer a hairstyle that requires no maintenance and will stay in place for hours, go with an up-do that is off your neck, pinned then sprayed in place. 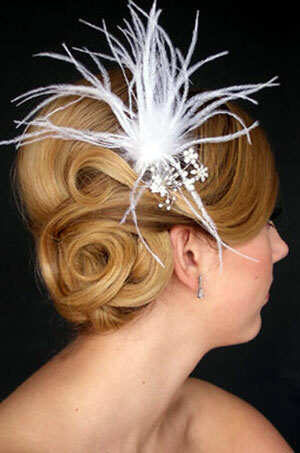 Wearing your hair down will require touch ups throughout the wedding day, especially if its windy or rainy. Determine your face shape and talk to your stylist about complimentary styles. A long narrow shape may be complimented with soft curls framing the face. Round face shapes may be more suited to an up-do with height. Consider ear shapes as well if your ears protrude, you may want to choose a style that covers your ears. If you would like more length or fullness, consider investing in hair extensions. For approximately $200, you can purchase real hair, snap in extensions that can be used after you wedding. Be sure your stylist if familiar with the process. At least 7 days before your wedding, have the ends of your hair trimmed, and hair color treated. Whatever style you select, be sure you are happy. Look in the mirror and feel confident and beautiful. This moment will be cherished for years to come in your wedding album! Susan Gill: A professional make-up and hairstylist for over 20 years, her career in the fashion business began early as a teen model. Based in Vancouver, she loves working with brides and helping them to create the right look for their special day.